Tony Nwoye casting his vote. Tony Nwoye, Anambra governorship candidate of the All Progressives Congress has accused the police of colluding with the All Progressive Grand Alliance to rig today’s election. The governorship candidate of the All Progressives Congress (APC), Dr. Tony Nwoye has raised alarm over the systematic clampdown of the chieftains and supporters of the APC. 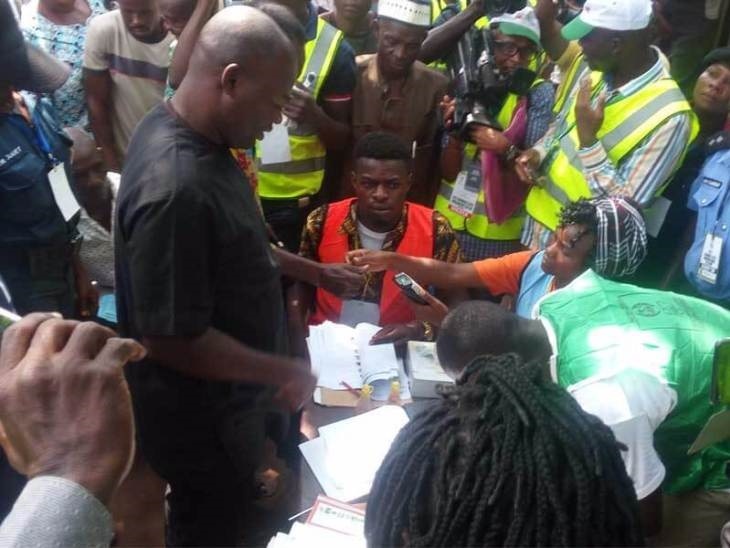 Nwoye who spoke with journalists shortly after casting his vote at Ofianta Polling Unit 002 in Nsugbe, Anambra East Local Government Area, alleged that the police is colluding with ruling All Progressives Grand Alliance (APGA) to compromise the exercise. According to the APC candidate, who arrived the polling unit shortly after 12 noon, “I am worried about the intimidation of APC supporters by the police. "They having been arresting key APC chieftains. From the calls I got, police have been arresting APC Chairmen. In some other cases our supporters have been brutalized by thugs aided by the police”. He however commended the Independent National Electoral Commission (INEC) for the preparation and conduct of the election so far, “so far I score INEC 50% but I expect improvement in the areas there are hitches”. On his chances, he said, “I am optimistic that APC will win the election at the end of the day”.